*This large item cannot be shipped outside of Tasmania for free or flat rate shipping. Please email shop@reliquaire.com prior to purchase for an interstate freight quote. 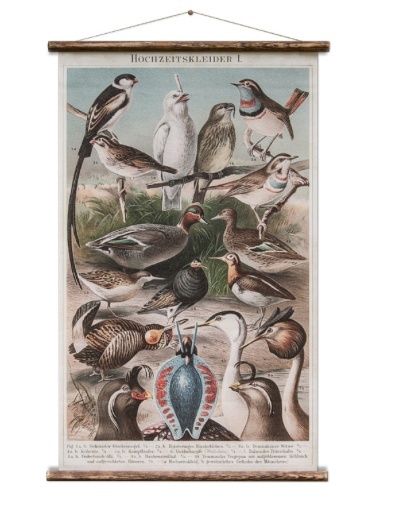 Size: 70cm x 120cm This ist he reproduction of the original illustration comparing male and female plumage, from the 5th edition of the ''German Meyers Konversations Lexikon 1893 – 1897“. This selection of the series has been perfectly preserved with all it’s wear-and-tear from over 100 years of use. The artwork has been printed onto Airtex canvas, with its brilliant colours and accurate detail carefully restored. Hand-mounted with aged timber batons and 100% cotton rope, each piece is supplied ready to hang.